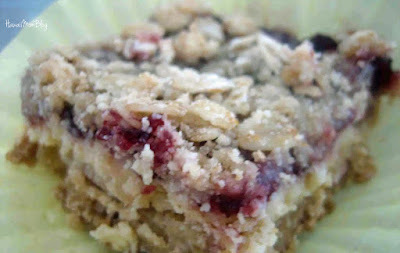 It's been a long while since I made Cranberry Cream Cheese Bars. At one point in time, I'd make them multiple times a year for gatherings. I just bought some cranberry sauce, and I plan on making them again soon. It's the perfect recipe for the upcoming holidays! Mix together the flour, oats, 3/4 cup brown sugar and butter in large bowl until coarse crumbs are formed. Reserve 1 1/2 cups of the crumb mixture; press remainder firmly onto bottom of prepared 9x13 pan. Meanwhile, mix together the cream cheese and sweetened condensed milk until smooth. Spread cream cheese mixture over partially baked crust. Combine remaining 1 tablespoon brown sugar and cornstarch in small bowl; stir in cranberry sauce. Spread evenly over cream cheese layer. Original recipe found here on Eagle Brand.